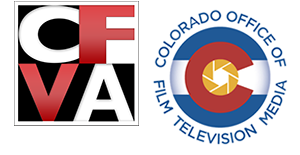 We have a 5 step film transfer process at Rocky Mountain Audio Video Productions, Inc. to transfer your film to DVD, Blu-Ray or digital files. 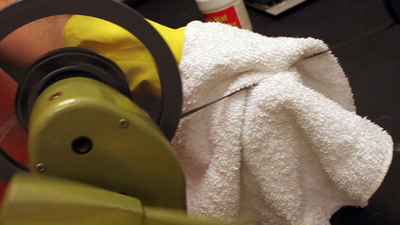 Once we receive your film, our process starts with careful cleaning of your film to remove any dust or debris, and exam your film for any splices that need repair. This step also helps lubricate your film, so your film will be returned to you in better shape then when we received them! This is a very important step, which if skipped, can result in a poor image transfer. 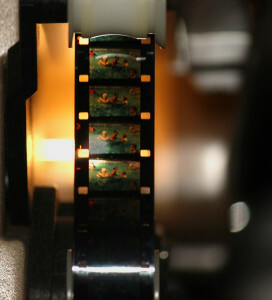 We perform 8 mm film transfers, Super 8mm, and 16 mm film to DVD, Blu-Ray and digital files. For 8mm and Super 8mm film, we will combine all your shorter reels onto a larger 400’ reel. All your original reel and boxes will be returned to you. Please let us know at the time of your order if you don’t want us to combine your reels. With 16mm film we will NOT consolidate your smaller reels onto a larger reel. We sill scan your 16mm, 8mm, and Super 8mm film at a native resolution of your choice - 2K (2048 x 1536) or HD (1920 x 1080). All of our film is scanned FRAME by FRAME! What this means is that we are scanning every frame of your film, and creating a high resolution digital image of every frame of your film. We’ll end up with thousands of these images, that will result in a stunning transfer that will capture the smallest details with amazing clarity and color. *Some other film transfer companies use systems that project onto a mirror or screen that will produce blurry images with multiple frames overlapping one another. To guarantee the best possible transfer, we ensure each frame of your film corresponds to an individual digital file with our Frame by Frame transfers! Handling of your film: Your film is old and precious! Our telecine film path handles the film ONLY by the edges for maximum film safety. No sprockets, no advance claws and no pinch rollers to possibly damage your film! Utilizing an enlarged film gate, we capture the entire frame of film - nothing lost and no over cropping. Most of all, the light source in our systems is a “no heat” diffused ultra-cool LED light source, so your film will never be burned or stressed by a hot lamp. 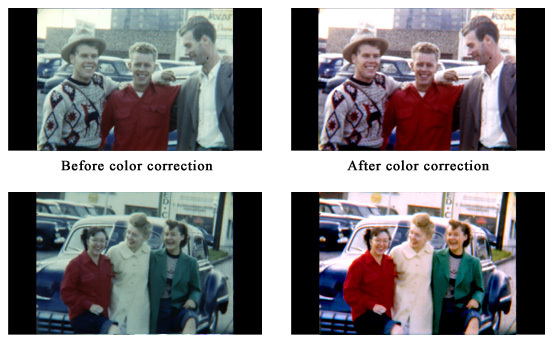 As film ages and deteriorates, it can oxidize and create a blue or pink hue to the images. We offer color correction for an additional $.10/ft. We recommend this service during your film transfers, since old films just start to chemically deteriorate due to age. 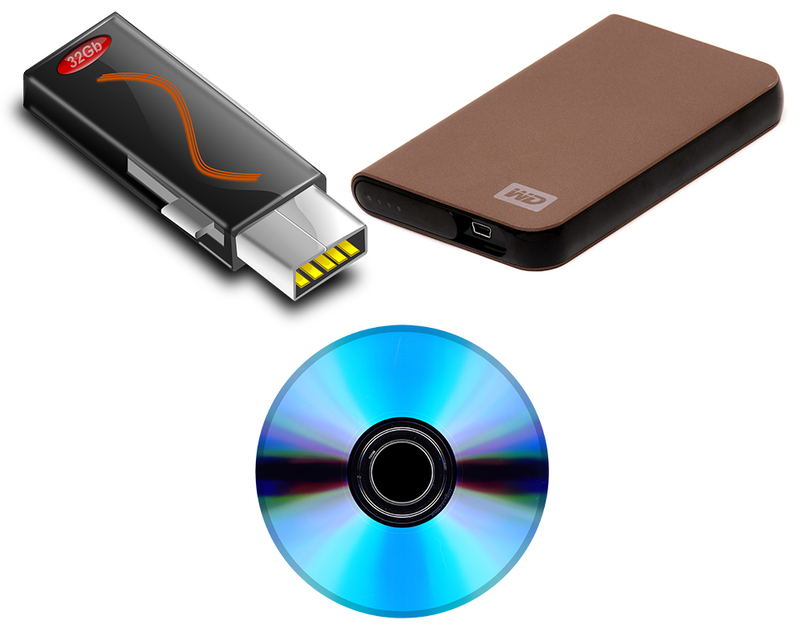 Before we output your transfer to disc or hard drive, our technicians will thoroughly quality check all aspects of your job. Many people don’t realize the process of outputting your film transfer to DVD or Blu-Ray is just as important as the transfer process! We go the extra mile and Author your DVD or Blu-Ray (complete with a custom intro), and don't use an inexpensive dvd/blu-ray recorders that can over compress and degenerate your high quality film transfer. Our authoring process is a time consuming effort that includes using broadcast software to control all aspects of encoding your digitally scanned film to DVD or Blu-Ray, so it will look it's absolute best when viewed. This will be a 2K or HD Quick Time Movie (motion JPEG-A) for video, if your film has a sound track WAV files will be created for audio. 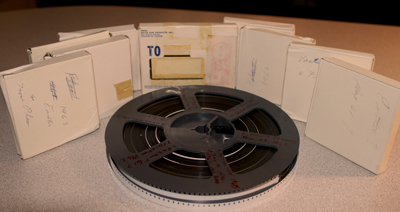 Note – Film Transfers with Audio: Capturing the audio from film is a separate process from scanning the film to video. The audio will be captured as a separate WAV file. When requesting “native telecine digital files”, you will receive 2 files – a QT file for the film transfer and a separate WAV file for the audio. If you want a single file with the audio embedded, we are happy to output a file of your choice for $25. Most commonly used by archivist is JPEG, but we can also do PNG, BMP, or TIF add $25/project: This option is ideal for archiving or if you are going to do additional editing of the film. There will be exactly one digital file sequentially numbered for each frame of film. If the film was shot at 18 fps, that’s the speed the image sequence will play back at. This image sequence may then be brought into an edit program and speed adjusted using your edit software. * Need a specific file format? Just let us know, we can also output to many other digital formats like ProRes, MP4, etc.